Kondratieff is perhaps the best known economic cycles researcher, having given his name to a cycle of around 54 years in prices and interest rates. 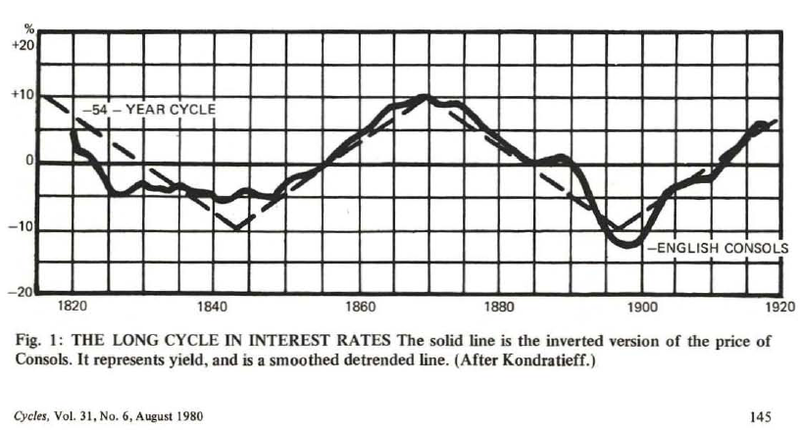 The following graph, taken from “Cycles” magazine in August 1980, shows Kondratieff’s interest rate chart from 1820 to nearly 1920. The ideal cycle of 54 years was added by Dewey as Kondratieff had simply stated that the cycle varied from 48 to 60 years. The graph identifies troughs in interest rates at 1843 and 1897. By continuing to add intervals of 54 years, we can expect further lows to occur around 1951 and 2005. Highs are expected in 1924 and 1998. Since 1920 we have passed through another one and a half cycles, showing perhaps two more each of highs and lows, so it is possible to see how Kondratieff’s dates turned out. The data used here is from the Data for Figure 2.1 in Robert J. Shiller Irrational Exuberance 2nd. Edition Princeton University Press. The continued Kondratieff cycle is very clear. The dates are a little different because the cycle is not perfectly regular. The most important thing is that we are now 6 years past the expected low in interest rates. Therefore we can expect interest rates to rise for the next 27 years almost. This entry was posted in economy-Finance, Economy-General and tagged 54-years, cycles, interest-rates, kondratieff. Bookmark the permalink. The actual cycles is 51.6 years Martin Armstrongs finding on 309.6 wave cycles in civilisation that consists of 6- 51.6 year debt-repayment waves, the last one was in 1981.35, if you know what happened then, interests rates went crazy. People should pay attention to this man; Watch The forecaster documentary. Notice the “They were greater than them in power, and they plowed the earth and built it up more than they built it up” So increase in confidence, and ultimately the end-game is a crash, and follows a cycle; just like the ECM model say above; Read the links above, then you will understand the ECM model. On Roman youths; change in religion happened after 309 years; So God protected the Roman youth from danger. By letting them sleep in the cave for 309 years and religion and society is changed. And there is also 8.6 year cycle presented in the Quran but that follows the 27.3 sidereal orbital of the Lunar month and the sidereal orbital of the earth 365.2 days and the roman lunar calender of 355 days to get this number; And from this 8.6 year cycle I get Pi to 5 digits. The 8.6 cycles is 6 cycles that make up 51.6 year waves. This man discovered Gods law. Without him knowing it; I just discovered this a month ago. I have found many long term series with the Kondratieff cycle in them and the period is usually between 53 and 54 years. I don’t have a lot of faith in Martin Armstrong’s periods. The cycle of religions is mainly a 600 year cycle (600 BC, 0, 600 AD, 1200 AD(?) 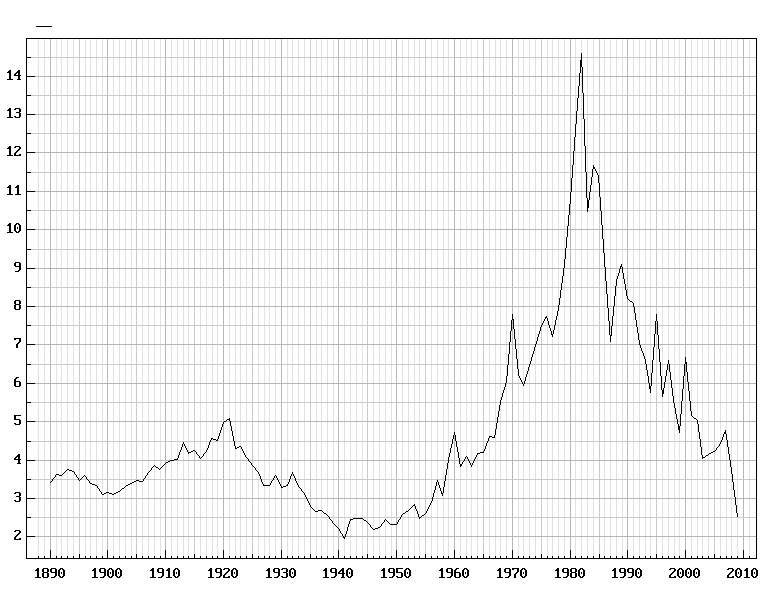 and 1800 AD although there is a secondary 300 year cycle. It is not done yet. But either way, it is very close to being finished. In the last section, you see how Shnolls cycles of time relates to Martin’s, it is my take. I can’t help see the correspondence. Maybe it is just a coincidence. The original method for finding cycles was Fourier analysis. Look in Wikipedia for details. It is not good at getti8ng the period when the number of cycles in the available data is low. Other methods that interpolate in such cases can get rather more accurate periods. Look for CATS software in cyclesresearchinstitute web site. It will do this. I get an error message on that link. Can you please send the info to me by email to ray(at)tomes(dot)biz? Edward Dewey has a 600 year religion cycle although there seems to be a 300 year component also. But I cannot see it being as long as 618 or 619 years. Thanks for the info; I was also thinking the Fourier analysis was one of the methods. I am physics student myself, just 2nd year, and we are just making use of Fourier analysis methods. It is really powerful! I am excited to use your software! So I hope you will look into it, and verify his work.